PLANO, Texas, Feb. 12, 2019 /PRNewswire/ -- Ruffles, the Official Chip of the NBA, announced its return as the presenting partner of the NBA All-Star Celebrity Game — this year with a charitable twist throughout the entire game that will benefit the Special Olympics. Ruffles and the NBA will host "The RIDGE," a 4-point line resembling the ridges in Ruffles potato chips, and Ruffles will donate $4,000 for every shot made from the line to foster environments of inclusion in sports in partnership with the Special Olympics, up to $40,000. With the NBA releasing its roster for the 2019 NBA All-Star Celebrity Game, players from the likes of reigning MVP and rapper Quavo to 2018 WNBA Rookie of the Year A'ja Wilson will have the opportunity to shoot from way downtown to score big for a cause. The RIDGE 4-point line will be open for the first and second half, doubling the presence from last year's game when it was featured in the second half. 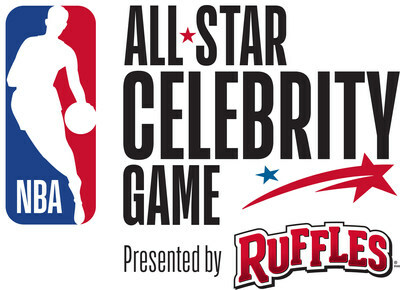 The 2019 NBA All-Star Celebrity Game presented by Ruffles will air exclusively on ESPN and the ESPN App, at 7 p.m. ET Friday, Feb. 15 from the Bojangles' Coliseum in Charlotte, N.C.
Ruffles will also be sending the ultimate "baller" to the game, a fan winner of the brand's "Live Like a Baller" contest. Last month, Ruffles challenged fans to submit a video on RufflesBaller.com describing what makes them and their crew "ballers" on and off the court. A winner from Louisville, Ky., won the contest and will receive VIP treatment, from exclusive NBA All-Star experiences, meet and greets with celebrities, NBA players and NBA legends, custom jerseys, red-carpet access, tickets to the NBA All-Star Celebrity Game and more. For fans who didn't get a chance to submit a video, they can still catch the action through February 22 by buying a bag of Ruffles and entering the code from the back of the bag at RufflesBaller.com. Fans can enter for a chance to win a baller trip with two friends to either Los Angeles or New York including VIP tickets to an NBA game, roundtrip airfare, hotel accommodations and VIP experiences unique to each destination. No purchase necessary, see RufflesBaller.com for full rules and details. Ruffles is one of many Frito-Lay North America brands – the $15 billion convenient foods division of PepsiCo, Inc. (NASDAQ: PEP), which is headquartered in Purchase, NY. Learn more about Frito-Lay at the corporate website, http://www.fritolay.com/, the Snack Chat blog, http://www.snacks.com/ and on Twitter http://www.twitter.com/fritolay. 04/24 PEPSICO : Tostitos And Avocados From Mexico Team Up To Bring Tableside Guac To T..
04/24 PEPSICO : Announces Grant Recipient of Inaugural North American Nutrition Greenh..
04/23 SPIDER-MAN&TRADE; : Far From Home And Doritos® Team-Up For A Global Action-Packe..
04/18 PEPSICO : Campuses Of The Future? PepsiCo Recycling Funds Green Initiatives At 2..